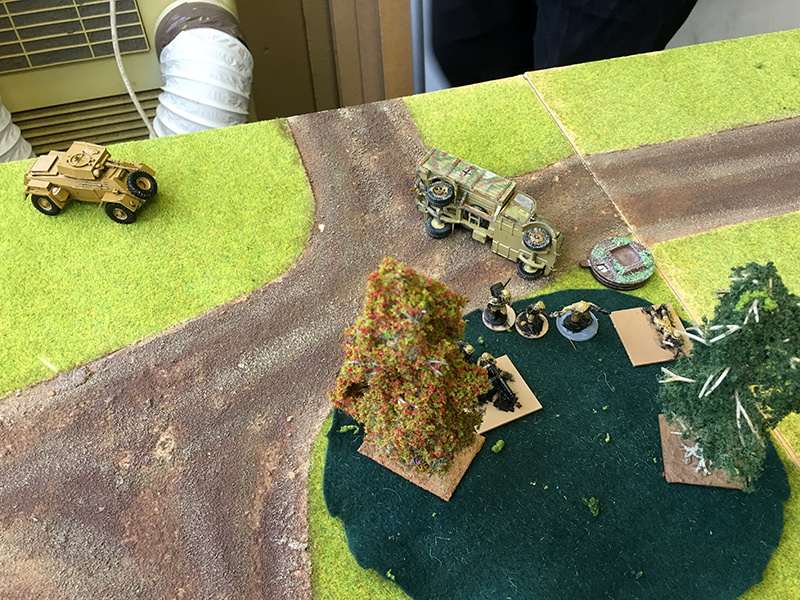 Every two weeks the “Lost Ark Landsers” meet at Lost Ark Games for a bit of Bolt Action. I used today as a bit of practice for the Shrapnel 2018 Tournament coming up in two weeks’ time. 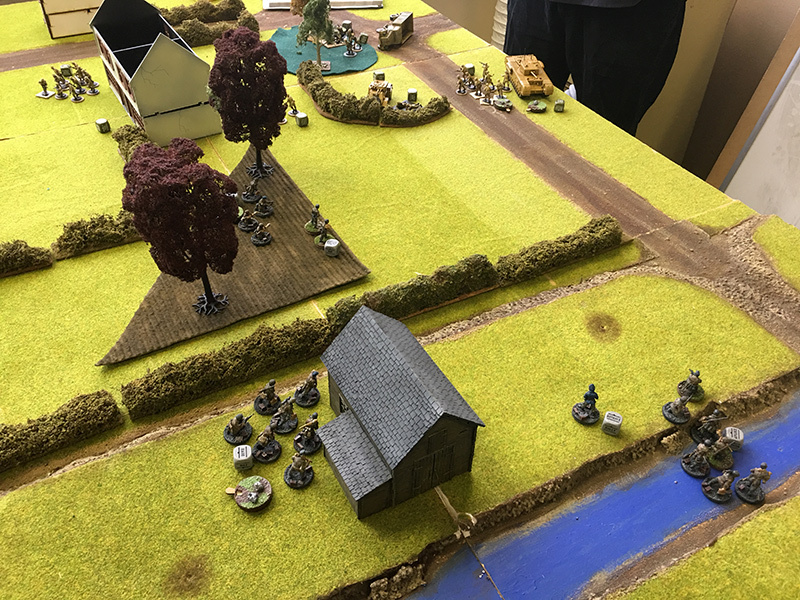 My Fallschirmjager took on Mark’s 8th Army Brits in a game lasting about 3 hours. My list consisted of two platoons of veteran Fallschirmjager. Each platoon had a flamethrower and a panzerschrek team. I also had a sniper team and two officers. No armour in my list but I had the Opel Blitz truck I bought a couple of days ago. 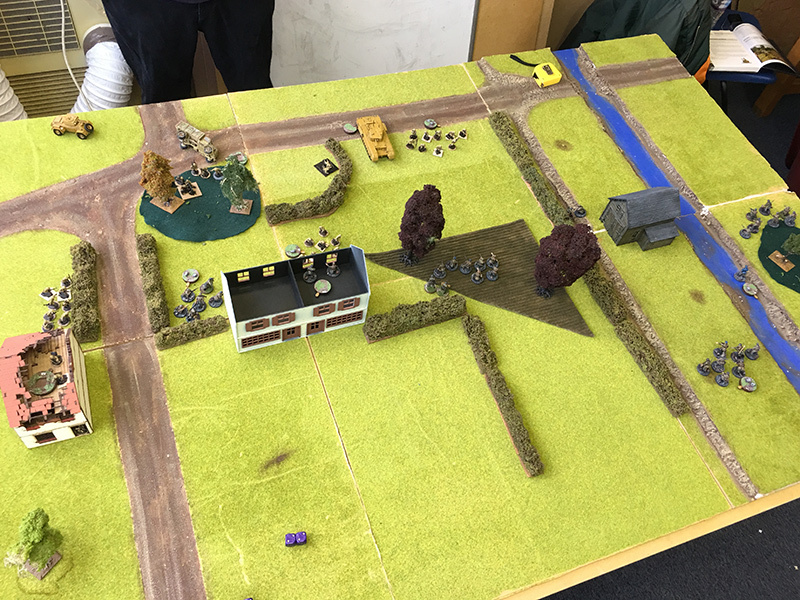 We played the No Man’s Land scenario from the main Bolt Action book and deployed units more than 12 inches from the centre of the table. I kept my Opel Blitz in reserve together with my second platoon’s flamethrower and panzerschrek teams. mark kept his armoured car in reserve. 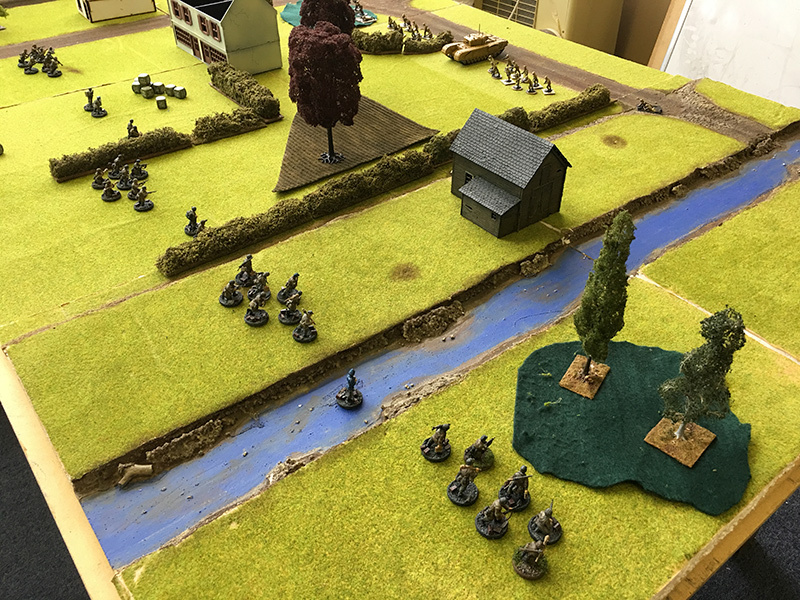 The Germans advanced towards the centre of the board. 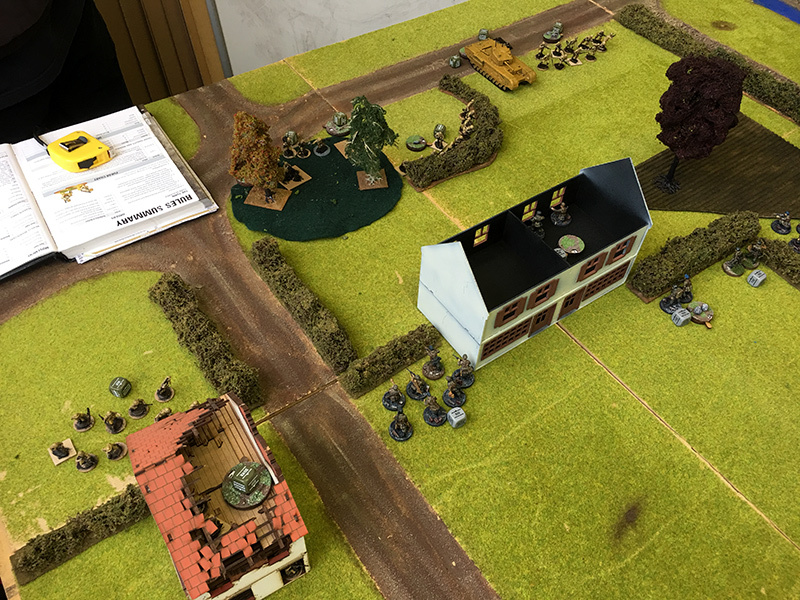 The British deployed their sniper and observers teams in the house on the German’s left flank, this proved to be a bad move as they couldn’t actually see any targets due to having no windows facing the centre of the table. 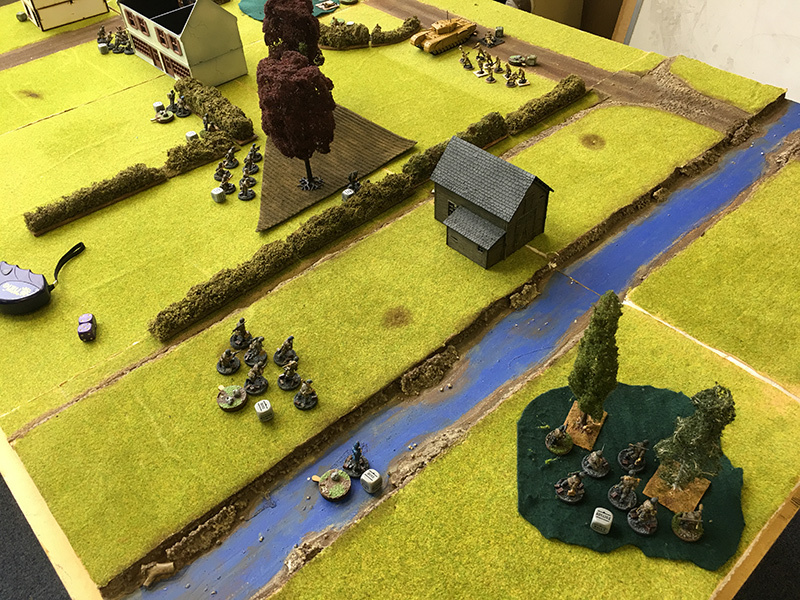 The British ignored the German’s right flank so the platoon on the right spent most of the game advancing towards the British lines without either firing or being fired upon. 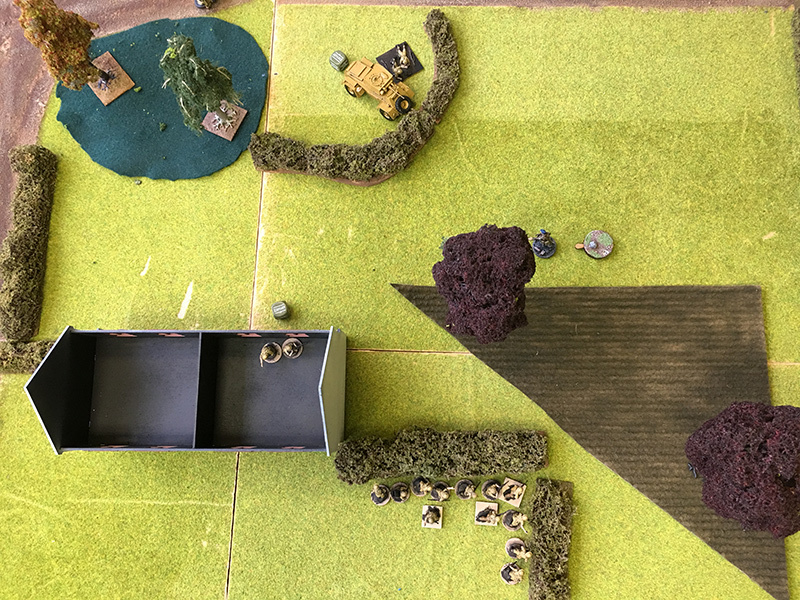 The British sniper, having come down to the ground floor of their building managed to step out the door and take out the German second platoon commander. 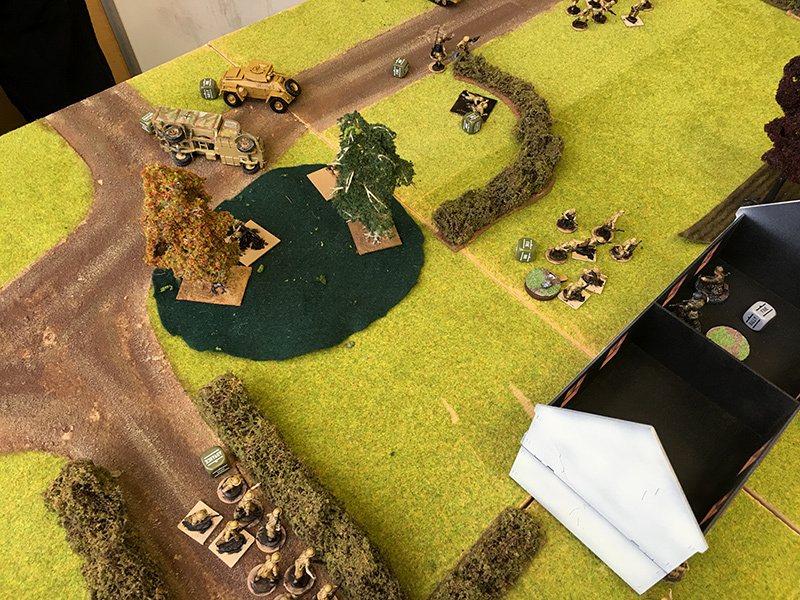 On turn two I brought on my truck and managed to run it right down the left flank and up behind the British command team. 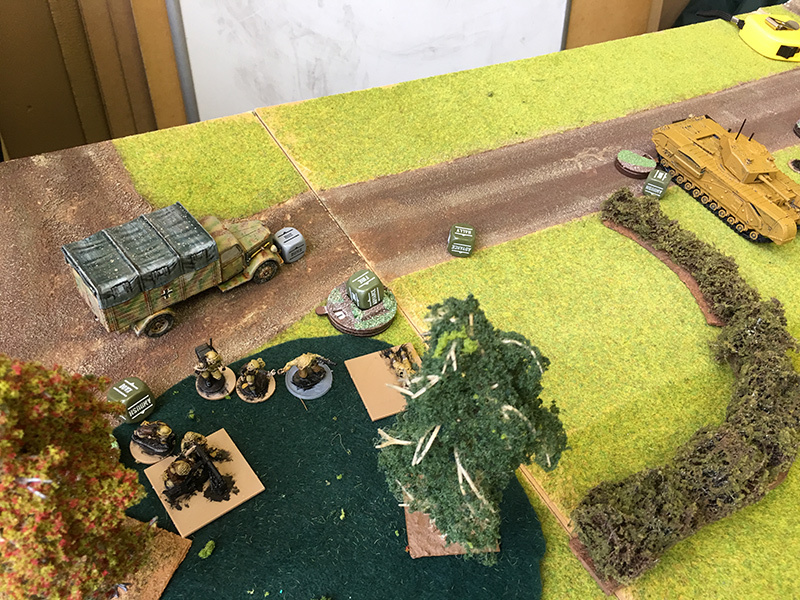 The idea was to pile out of the truck on the next turn and attack the British Churchill, however, the British brought on their reserve armoured car and managed to take out the truck from behind. In doing so, it also took out the panzerschrek and flamethrower teams inside in their entirety. 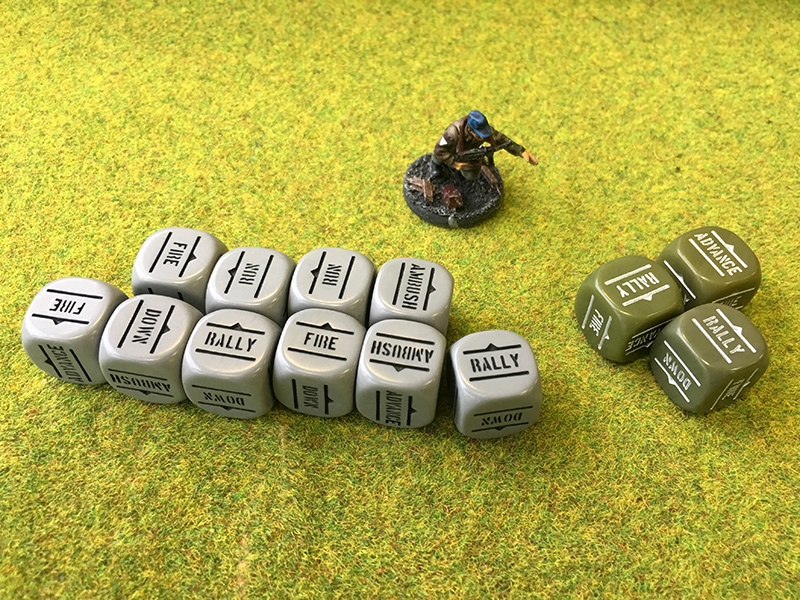 Three dice lost in one hit. It started to go downhill and didn’t get much better. 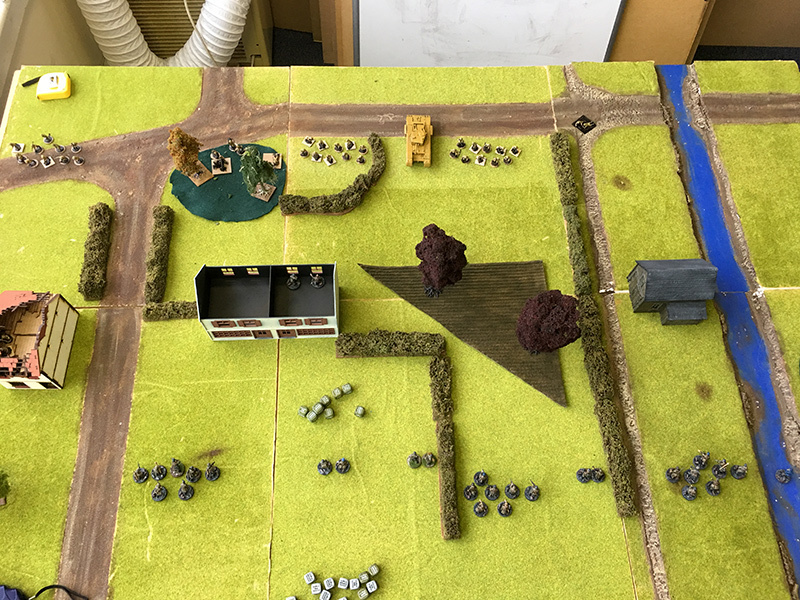 The first German platoon managed to take their first casualty from the British unit in front of the centre house but in doing so got wiped out by other British units. 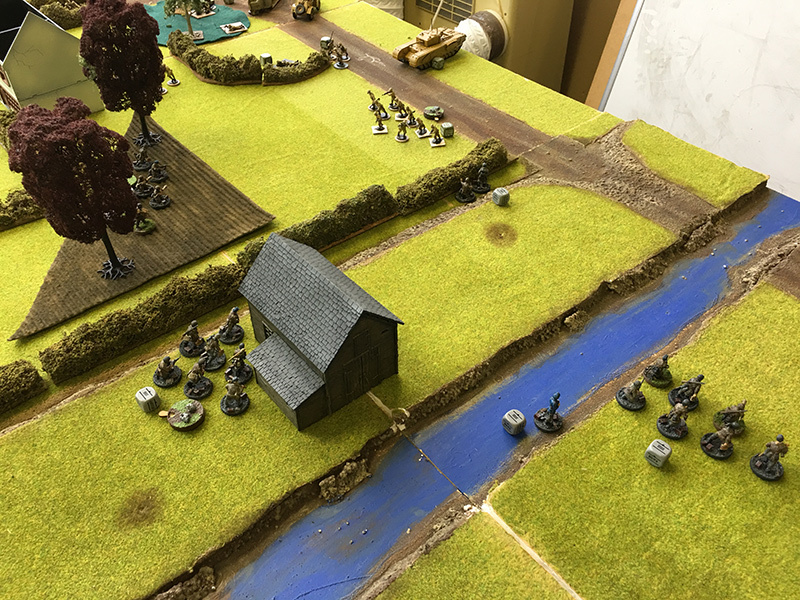 Meanwhile the German right flank still hadn’t fired a single shot up to around turn 4. 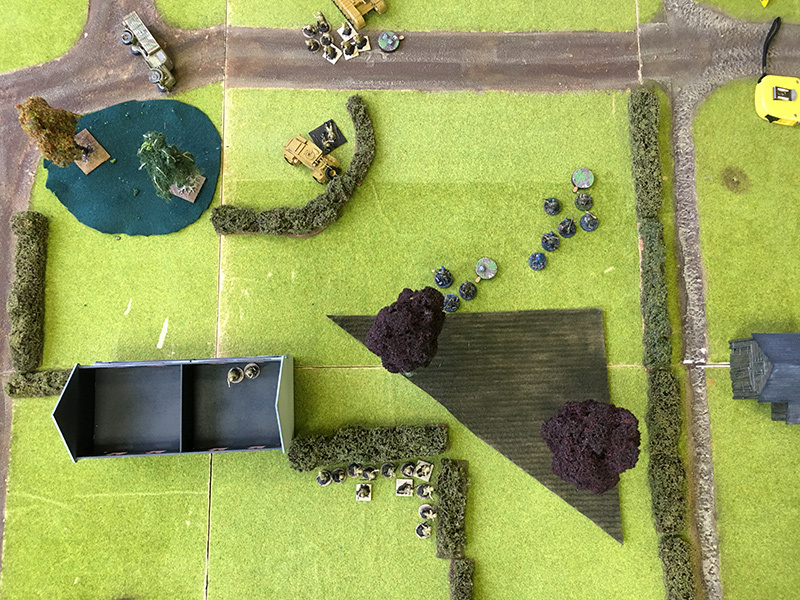 The second platoon’s panzerschrek team entered the woods and managed to get in range for a shot of the Churchill, a hit was scored but they only managed to jam the Churchill’s turret. This did see the Churchill reverse away from trouble on the next turn, thought it continued to use its MGs to good effect. 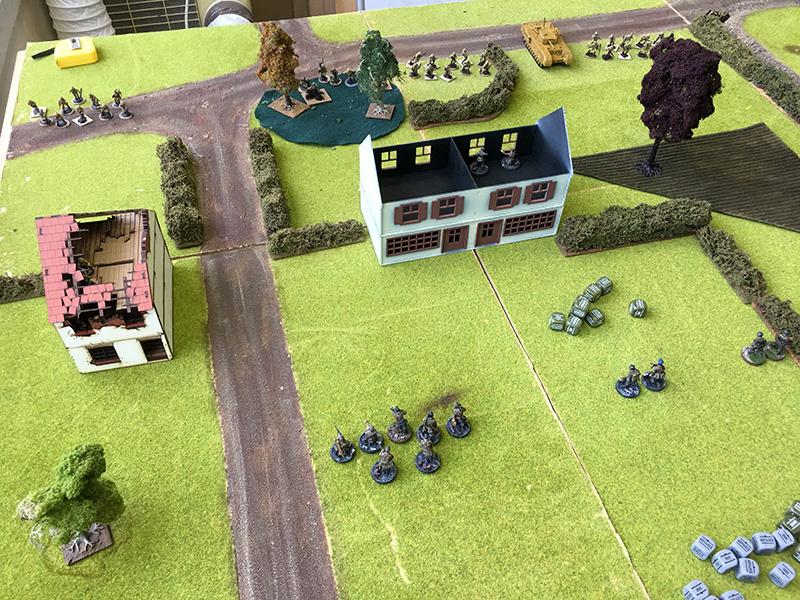 The Germans continued to take more dice off the Germans who took out the British command team and anti-tank rifle. But ultimately the British took the rest of the German units off the table leaving just a single NCO to sign the surrender.